The PEN Ten is PEN America’s weekly interview series. 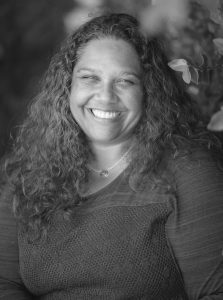 This week Della Green, Workshops and Administrative Fellow at Cave Canem, speaks with Amber Flora Thomas, who has received fellowships from Yaddo, Atlantic Center for the Arts, Bread Loaf Writers Conference, and Sewanee Writers Conference. My senior year in high school, I had an English teacher from the Netherlands who introduced me to British Literature, specifically, Ian McEwan’s The Child in Time, which is a novel about a man trying to come to grips with the abduction and loss of his three-year-old daughter. McEwan’s characters are often confronting external conflict through thick veils of internal turmoil. The main character is a writer and the interiority of his reflection made me want to be a writer. It was the character’s voice combined with his effort to negotiate the pressures of work and life that helped me see what could be done through writing. I can’t remember the pinpoint of inspiration for poetry…it might have been when I was eleven years old and my father brought me a copy of his self-published chapbook of poems. I flipped through the pages, recognizing poems I’d heard Dad recite numerous times over the years. Being a writer wasn’t out of reach in my home, so my aspiration began at an early age. 2. What role does narrative play in how you shape the truth? I appreciate being asked how truth ‘plays’ within narrative and the importance of the shaping of truth. Too often we assume what the poet writes is literally true in terms of experience. Currently, I am working on personal essays and poetry, so the shaping of truth in narrative has been on my mind. In the poem it has been very convenient for me to mold the truth as is necessary for sound and language. The poem will quickly choose one path which may necessitate a change as small as placing the poem by the river, rather than the sea. Yet, the more radical changes have to do with point of view. Sometimes I must become the watcher for an experience that happened to me to tell a larger, more impactful tale. My early memory has been fragmented by trauma, a well-spring I draw from frequently. For much of my childhood, I remember only flashes or slivers of events that changed me at a cellular level. The fragment is my subconscious mind trying to protect me. Still, after 40+ years, my conscious mind has blind spots when it comes to the violence, sexual assault, and emotional abuse I suffered in the first part of my life. Yet, the writer’s mind seeks natural points where the flashes and fragments can be gathered into narrative. In poetry and prose, the connective tissue happens where the narrator of this present moment, Amber ‘now’ seeks to unify with the Amber ‘then’, the remembered self. I do think all three of my books show my evolution in seeking a way to unify the fragments in a truthful way. In this effort, I have found truth, or at least acceptance for the unifying tool which is the mind. Some call it vision. And it has been an incredible journey toward locating my damage as power. So far, I haven’t had a problem with inspiration. I have a problem with time. For years, I put my writing aside to take care of everyone else and what they needed from me. I can’t do that anymore. I’m a professor and get pulled in many different directions between teaching and service, so I write sporadically. When I travel for readings and conferences, I find this is an excellent time to get writing done. I don’t waste those hours at airports or on the plane. Also, travel helps me find new material since my current manuscript project is a book of poems about place and travel in America. The writing is pushing its way in front of everything else. I’ve chosen to listen and write. Surprisingly, worlds have not crumbled because I’ve prioritized my writing over other obligations. 4. How can writers best contribute to society? How can artists affect resistance movements? Poets are the shepherds of meaning. We see the point where the personal and the universal converge. We see the point where nature and the human collide. And, we can tell you about this nucleus in a single line, so everything you thought you knew about your life will snap into focus. We are earth-bound spokespersons for awe. And awe is awesomeness, is God (by any name). There are other ways we can affect resistance in a culture of violence, greed, laziness, and ignorance; however, being awake and telling about the world is what we do best. 5. What is the last book you read? What are you reading next? 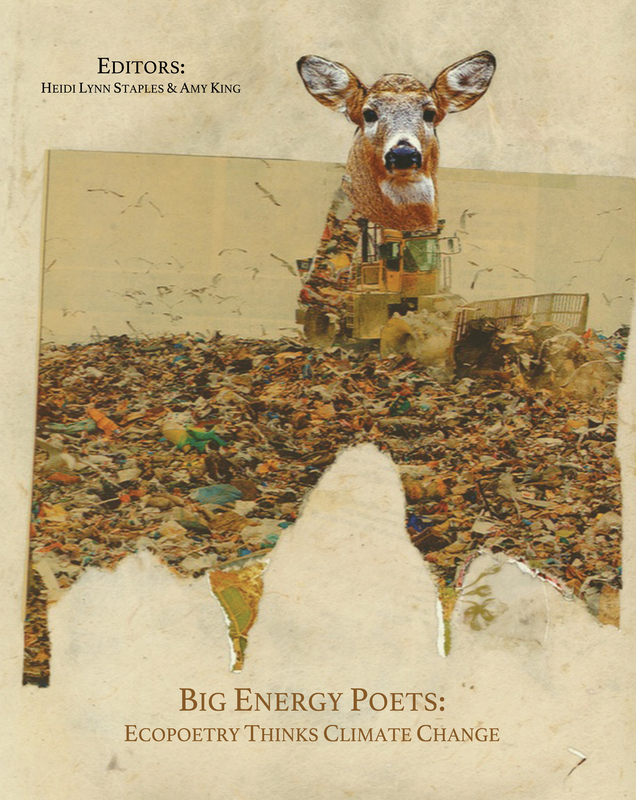 I’m currently reading Big Energy Poets: Ecopoetry Thinks Climate Change, edited by Heidi Lynn Staples and Amy King, preparing for a panel at the New Orleans Poetry Festival. And, a fellow poet recommended Still Life with Two Dead Peacocks and A Girl by Diane Seuss, which is just excellent. Recently, I stumbled on the work of Mei-Mei Berssenbrugge in an eco-poetry anthology. I was so moved by her voice that I ordered her books via interlibrary loan. As I continue to write poetry of place, I’m seeking more voices to illuminate how the poet moves from pastoral poetry into post-pastoral poetry, an effort that recognizes the necessity of changing our relationship with the planet. 6. How does your identity shape your writing? Is there such a thing as “the writer’s identity”? I’m sure there is such a thing as a “writer’s identity,” but it sounds highly suspicious to me. I imagine this fame-driven person who spends as much time promoting her writing (more even) than actually writing. This is a person angling to be famous. Perhaps you are asking about whether I believe there is a poetic “I,” a speaker who is not me exactly, but a different version of myself who appears within the poem. Yes, I do experience this persona. She (generally) is a necessary voice on the page—she gives me distance from experiences I cannot hold in my body any longer. Yes, to answer your first question, identity influences my writing. I look at the world through the eyes of a queer woman who has one white parent and one black parent. I grew up in a small town in California beside the Pacific—these are some of the primary places I speak through. I know neither of my parents likes it when I refer to whiteness and blackness since they spent my childhood trying to hammer in the idea that we are all people of color. They tried to train my siblings and I that, at least in our house, we didn’t see color. It’s kind of funny that people cannot identify my race when they look at me, so my parents were successful within my physical make-up. Yet, I have one black parent and one white parent; these are distinctions that do not get ‘mixed’ in my consciousness; they exist side-by-side in my understanding of my culture and this is perhaps a kind of racial consciousness. 7. What is the most daring thing you’ve ever put into words? Have you ever written something you wish you could take back? There are some stories I haven’t dared to put into writing. I was silenced as a child and it has been a struggle just to break silence and let the mask slip a little. I was in a Feminist Literature course at Bucknell University in spring 1993 when I was introduced to Audre Lorde’s critical work and poetry. I read her work with profound admiration and terror. Here was a woman who lived and wrote regardless of resistance, fear, and anger. I triple underlined a passage in an essay about her discovery of a tumor. She wrote, “Your silence will not protect you.” I was 20 years old and already publishing. I’d been selected out of hundreds of applicants for the Stadler Semester Younger Poets’ semester and I considered myself brave in my life and in my writing. I’d made it out of poverty and survived childhood violence—just this was all I could bear; it was my bravery. 26 years later, I am still circling my damage, looking for a way to approach that won’t kill me. I’ve started to write essays because I finally understand how the present and past work together to form stories. I would not have been able to write these stories when I was 20. I hadn’t gotten far enough away from my childhood. Regarding daring, we must risk ourselves every time we write or it’s just not good enough. The cornerstone of good writing should terrify us. Even the most beautiful orchid when really seen should transform our knowing. 8. What advice do you have for young writers? When you become a writer, you will not be able to compartmentalize your life. Your friendships, your family, where you work and how you live: you will not be able to keep these separate. You will not be safe or have enough time. The mask you hold up will slip off. You aren’t too young. Yet, you can’t see it all either. This is okay. If you really want to know how a writer lives, read their books. This will tell you everything you need to know about how to write and how to be a writer. 9. What do you think makes a piece of writing compelling? I am drawn to the poetry of place. If a poem brings me into the forest, or the rank teeming orange glow of the subway, I’m going to pay attention. We need to record this terrifying moment in history. Writers who can move between the personal and universal are of great interest to me. I am not afraid of the ‘I’ in poetry. The consciousness standing in the middle of a place is the origin or point of explosion outward. Yet, we must move from the origin into the world, not to look back at the self, necessarily, but to look at where we find ourselves in time and place. Since I started writing, I’ve been trying to find away to speak about my personal pain. It’s taken me years, but I understand that I can’t resolve it or overcome it in the poem, so I’ve moved on. Finally. 10. What are some of the significant ways the natural world informs your writing process? What does nature teach you about poetry? This is kind of like asking how the air influences my daily life. Even in the largest city, I’d be the woman watching rats navigate the subway track, seeking in that non-human presence to know how things are in the world. Nature is evidence of what we cannot control. Yet, the human mind is awesome nature, too. I look at what we are building, destroying, and making out of the natural world as evidence of what is being built, destroyed, and made of our human bodies. This isn’t to suggest that nature exists to show us how to live, but climate change is real, and humans are in crisis; these are two windows looking into the same room. I am a nature writer in the traditional sense. And, I write about the environment. I’ve been told that I’m an empath. I’m particularly sensitive to pain. If there is suffering around me, I feel it. In my poetry, I want to record what is happening in the natural world, to find the point of collision between humans and nature. Poetry is the ultimate human expression. As I said before, we are earth-bound spokespersons for awe. We must make the connection for everyone’s sake.